Money for Nothing was formed in 2000 as a tribute to one of the world’s premier rock bands – Dire Straits. The abundant energy and the excellence and musicality of their performance makes Money For Nothing a “must see” for any rock enthusiast or Dire Straits fan. Fronting the band is the brilliant guitarist and Mark Knopfler sound-alike Aled Williams. 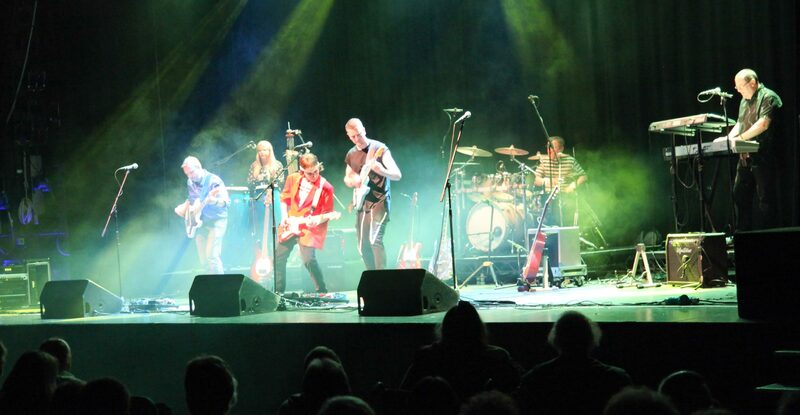 Behind him the line-up features top-class and experienced musicians that make this band a worthy tribute to Dire Straits. Aled and all the band have studied Dire Straits in great depth to re-create their tribute to be as close as possible to the real thing. Featuring all the hits from their first ever single ‘Sultans of Swing’ to ‘Brothers in Arms‘, ‘Walk of Life’ and their last single released in 1992 ‘The Bug’ – also the legendary ‘Money For Nothing’ (ft Sting) which was the first ever video played on MTV. The band also include versions from ‘On the Night’ and ‘Live @ The BBC‘. The Money For Nothing stage show has been performed all over Britain and the world, at all types of venues & events – from music festivals, theatres, nightclubs and venues. 2010 saw them headline the main night on Europes Biggest Tribute Festival. The band have also had the pleasure of performing as show opener for the legendary Roy Wood on part of his Theatre Tour. Sept 2011 saw them take their show to India to perform at a sell-out concert where they headlined an event held at one of Bangalore’s largest Amphitheatres. Their special appearance was featured in the worlds largest selling English-language daily newspaper, The Times of India. Dire Straits are one of the best bands to ever come out of the UK, they have sold in excess of 120 million albums worldwide and were the UK’s first stadium rock band. Their best selling album Brothers in Arms was an international blockbuster selling over 30 million copies and becoming the fourth best selling album in UK chart history. Brothers In Arms was also the first ever CD single, and the first ever album to sell over one million copies on CD. Dire Straits also won numerous awards including, three Brit Awards, four Grammys and two MTV Music Video Awards, and in 2009 they were awarded the Music Heritage Award.